Home › Cosmetic Dentistry › How Do Dental Implants Work? Let’s take a closer look at a cosmetic dental implant. A dental implant is made up of three parts: the implant, the abutment and the dental crown. 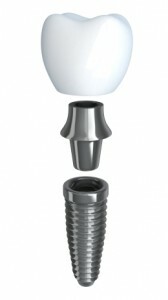 The Dental Implant: The implant itself is typically made up of a titanium screw. It was discovered in the 1950’s that titanium is an ideal metal to use for prosthetics and oral surgery because of its compatibility with the human body. Titanium is able to bind to bone during a process called osseointegration. By physically bonding with the jawbone and living tissue, the titanium implant acts just like a natural tooth root. Titanium is also extremely strong, yet lightweight, making it the ideal material for replacing a tooth root. After a consultation with Brentwood cosmetic dentist Dr. Dennis Wells, the titanium implant is placed in the gap left by a missing tooth. Following your placement surgery, you will wait a few months to ensure that the implant has formed a strong bond. The Abutment: The abutment is a titanium cylinder that your dentist fits on top of the dental implant. This part of the implant procedure is vital for connecting the implant root, to the tooth replacement or dental crown. Dental Crown: This is the final portion of the dental implant. Once the implant has bonded with your jawbone and the abutment is placed, your dental implant dentist will place a dental crown on the abutment and your implant placement is complete. Dental crowns are frequently made from porcelain because its color and translucency mirrors that of your natural teeth. Your Brentwood dentist will work with you to ensure that your replacement matches the color and shape of your natural teeth, making the dental implant virtually indistinguishable from the rest of your smile. Enjoy the benefits of dental implants and have your smile restored by calling us today at the Nashville Center For Aesthetic Dentistry: 615-371-8878 . ‹ What’s the Difference Between Traditional And Prepless Veneers?